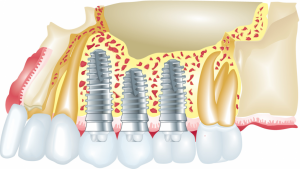 If you have some or all of your teeth missing, then you might want to consider getting dental implants. Single tooth and fixed multiple teeth replacements are available with dental implants in our Fortitude Valley Brisbane dental practice.Our dental team at Precision Dental in Fortitude Valley will assess and plan your implant needs. You can be rest assured that you are in safe hands as our implant team is extensively trained and experienced. So why would you choose implants? Well, when you lose a single tooth or several teeth, the jawbone that supported them would no longer receive the right amount of stimulation. This then would lead to resorption. 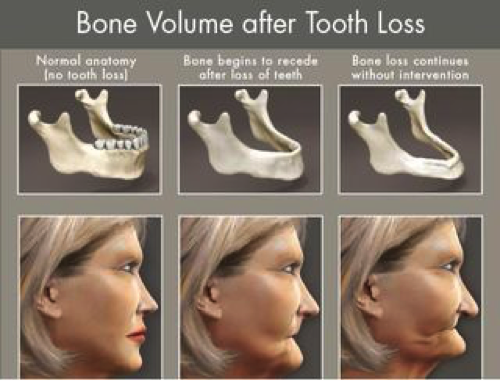 This means that, in the first year, around 25% of the bone width will decrease and consequently, the height will also reduce in the years following this.Once this bone (alveolar) has deteriorated completely, the jawbone (basal) will also resorb or in its simplest sense, melt away. This will have a serious effect on speech and also facial aesthetics, not to mention eating difficulties! The use of dental implants is the only procedure that stops resorption in its tracks. These tooth replacements fuse with the bone, keeping it and all the surrounding tissues healthy for a very long time. Your dental care partners here at Precision Dental will carry out a free consultation to see if you are a suitable candidate for dental implants. Also, your medical history will be evaluated. There may be some factors that could affect the success of the treatment such as; gum disease, diabetes, smoking, alcoholism, and cancer. Our specialist will then check your teeth and gums carefully before any procedure takes place. We will plan the tooth restoration and discuss the treatment plan with you, including the costs, risks and benefits, as well as treatment alternatives available. The dentist will carry out the work and insert the dental implants into your jawbone. After the treatment has been set it will take around two to six months for the dental implants to fuse to the bone through a process called osseo-integration. Next, the treatment will be completed by having a dental crown or tooth restoration attached to your dental implants. Experience the most advanced way to replace missing teeth today here at Precision Dental. Our efficient administration team in Fortitude Valley will work together with your insurance company in order to give you the utmost value for your treatment allowing you to enjoy your fantastic new teeth, healthy bones, beautiful smile, and happy face! For top-notch Restorative Dentistry solutions, contact your trusted Brisbane dentist here at Precision Dental.